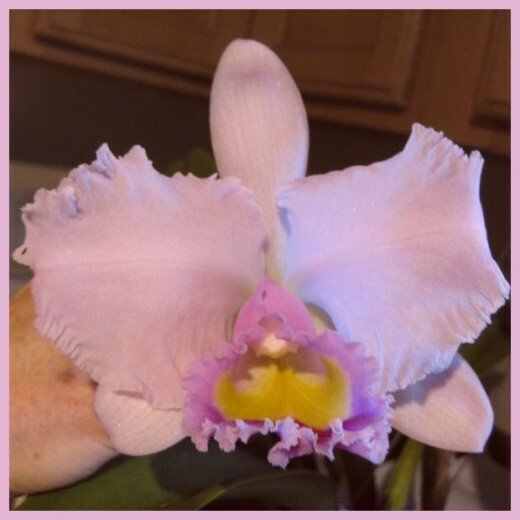 He Loves His Blooming Orchids - And So Do I! My husband, a very private man, just loves his orchids...and they bloom...period. He won't let you in to see them, so - shhhhh! - you'll have to enjoy them here. For him, orchids that are not supposed to bloom in our climate - do. Orchids that are supposed to bloom only once a year - don't - they bloom several times a year. Orchids that should die without a lot of attention, appear to defy their own DNA, or something, and they don't just survive - they thrive! All I can figure out, is that those orchids must somehow know - he loves them! Thought you might like to see some of his stupendously lovely orchids, so I put a few up here for you. If you look, there are more of his here on HubPages - some are quite unusual, and some of them staged a "rebellion". You'll see the links, below. This is a trio of breath-taking beauties that bloomed April, 2009 - spectacular, no? PLEASE REMEMBER - YOU HAVE BEEN WARNED! 'cause NOBODY, but NOBODY gets in to see the Wizard. No way, no how, not now, not ever. That is - nobody but ME! 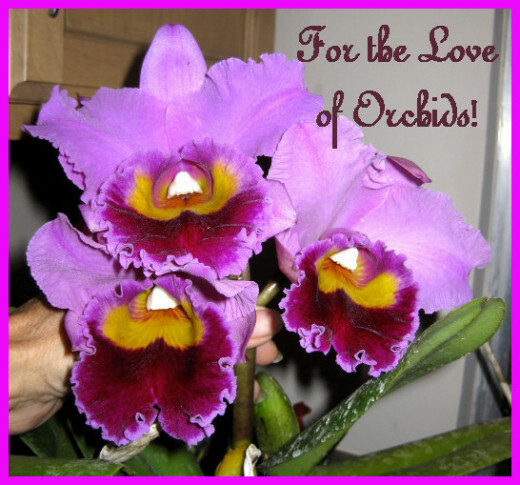 Which of my husband's orchids featured here, did you like the most? Frankly, I don't care for ANY of them! This one looks like it should be next to a bottle of champagne, doesn't it? No, he is not going be the featured speaker at your Orchid Club. No instructional YouTube videos, and no orchid repotting classes. Forget it. No, I cannot cut you one, ship you one, or steal you one. He just loves to grow them, and shares them with friends and family, but - that's it! This one is just too lovely for words, really! When it blooms, it is always such a shock, to see those peach pastels on its petals, framing the vibrant, intense colors on its "tongue". 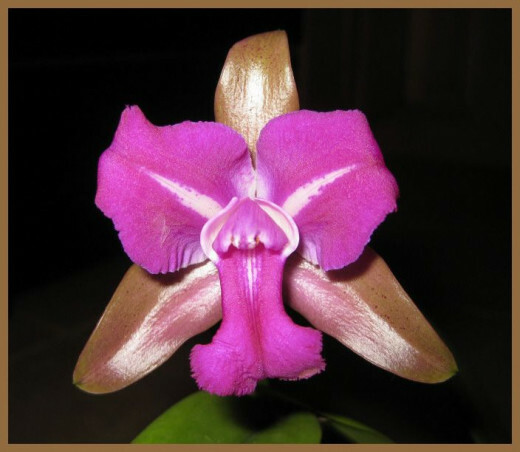 This orchid blooms on a very L-O-N-G stem, and faces up, beautifully! I call it The Champagne Orchid. What is its technical botanical name? 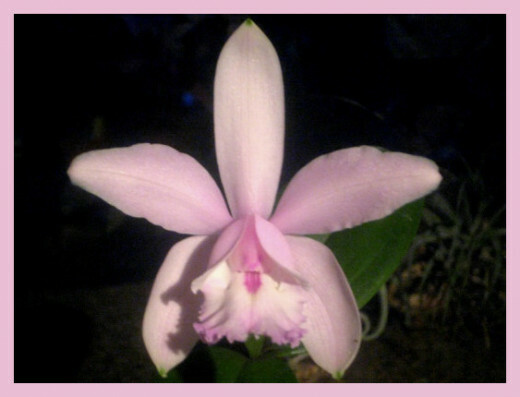 Cattleya? Laelia? Dendrobium? I don't know! I could find out, but...I'd have to wait until it blooms again, and read the tag, and most of you wouldn't care anyway, so just ...enjoy the photo; there are more below, and let the "orchid specialists" tell you their names, okay? Had to look, didn't you? For shame! I TOLD you there weren't any, but you didn't believe me! Below, there are a lot more orchid photos, so keep "scrolling"! Can you believe the colors? The deep muted pink on the droopy sunshine yellow petals - isn't that great? Look inside the lip - see that lovely yellow repeated there, among the "striping"? The wine-colored lip is just too spectacular for words. Oh, I wish that you could see this orchid in "person". Only my husband and I were privy to its beauty - that is - until now! Frills and elegance, what more would you like? When this one bloomed, all I could think of was - "understated elegance". Fits it to a "T", doesn't it? One would expect to see this elegant orchid gracing the table of an old Southern Plantation, back in the Civil War Times, or in a photo of the lobby of the Waldorf Astoria hotel, or as a corsage on the dress of the Queen of England. Doesn't it strike you that way? 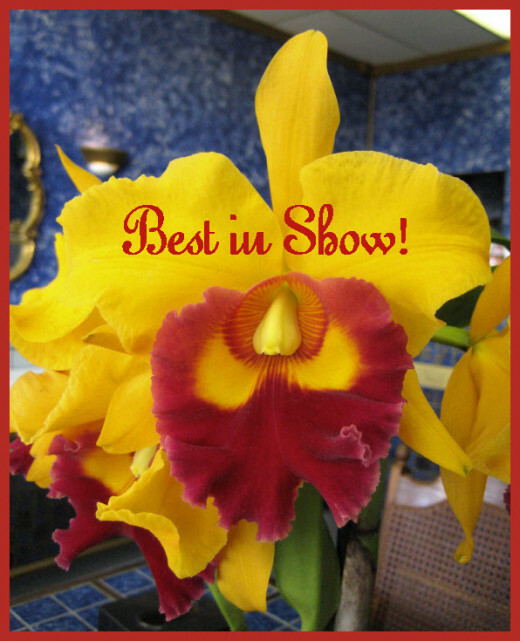 The Prize Orchid in the Show - Well, it didn't get an award, but it was the best! No one believed it was real! 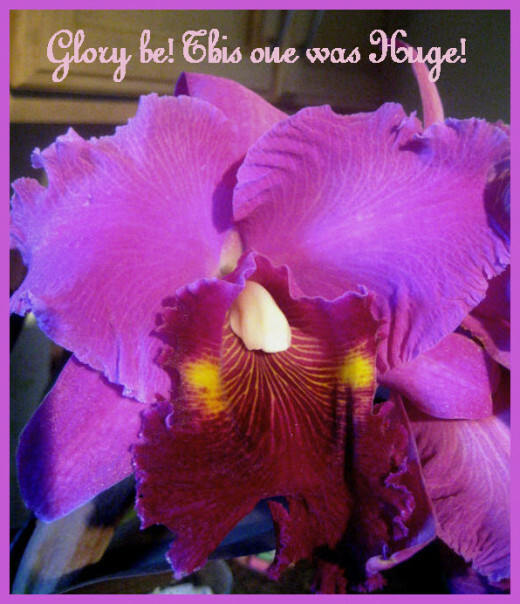 When my husband bought this huge orchid, for me - everyone wanted it! He got a lot more attention at the orchid show, than he wanted - just "carting it" around. I brought it to my jewelry store, and put it up on a stand, right in the front window. People passing by did not think it was real! They came in just to see it, and I heard them say to each other - "Oh, it's artificial". Artificial, my eye! I was so shocked, and a little disgusted, that I hurriedly made an attention-getting sign, and put it up in the window, right next to the orchid. It said - "Come in and see me - I am a REAL orchid!". The orchid's petals glisten, and its lip feels just like velvet! Honestly - this one did not look like a genuine orchid, when it opened its petals. I still cannot believe the rich colors it displayed. Talk about a difficult photo to take - phew! You know, cameras have a bit of difficulty with reds, but I got it! Can you believe the beauty here? 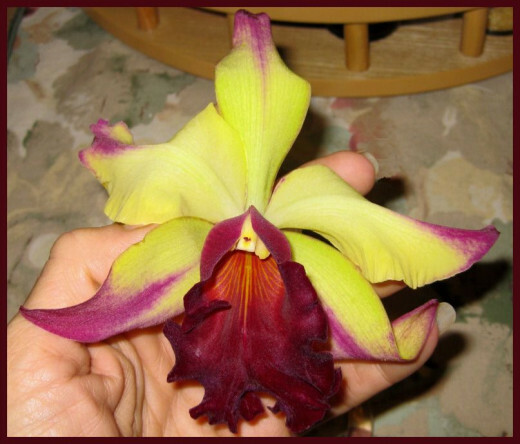 The deep yellow hue really showcases the intense burgundy color of the orchid's lip, and is the finishing touch to this incredibly lovely blossom. Oh, it's an orchid, all right! Quite a study in incongruity, no? What a shocking orchid! Not only does it have "spots" on its petals - look closely, you'll see them - the petals are just about bronze-colored. Now, pair that, with the hairy fuchsia lip, and the two other petals, and this one looks like a "freak of nature". No, it's more like - another magnificent idea, from God! 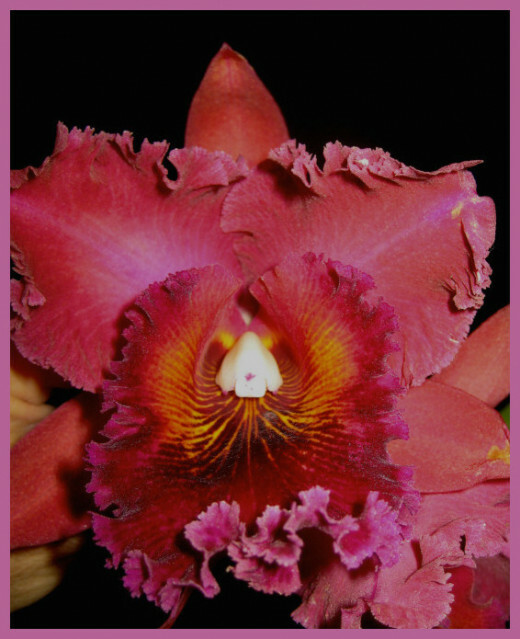 Best of the Red Orchids - it really IS ruby red! Splashed all over the bottom of this particular orchid, just happens to be my absolute favorite hue of red. 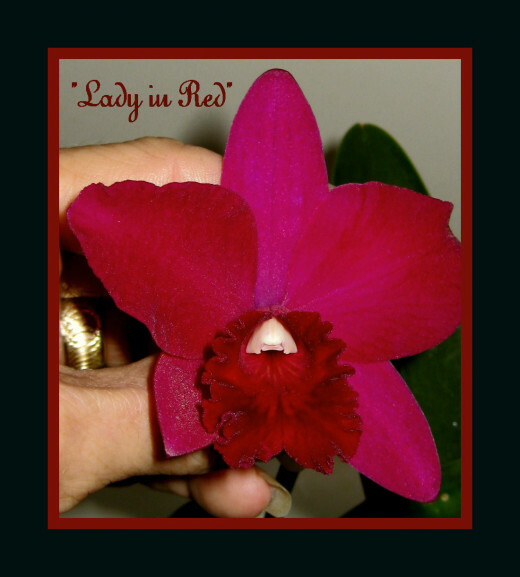 Not only is this unbelievable orchid that exact shade of red, it also sparkles! I know you can't see it, but, on all of the petals there are little shimmering points of light that look like "mini-glitter". In the morning sunlight, or at night, with a light pointed right at it - those tiny "flecks" of intense white, resemble diamond dust. This isn't the largest, the smallest, the widest, or the tallest - but it is a bloom that once seen, is never forgotten! Remind anyone else of Dumbo? The delicate pastel pink petals of this particular orchid, could be right at home in the parlor of a princess, don't you think? 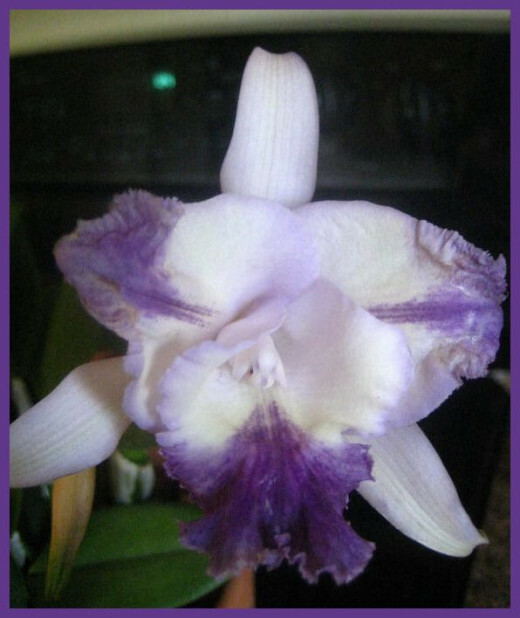 In addition to being a very showy orchid, this one bloomed for a long, long time - over a month! I think that it looks like Walt Disney's "Dumbo". Well...look at it! Can you see that? Time for the twins tea! Here's an elegant duo that looks like they are ready for a tea party. Oh, that's right - orchids don't go to tea parties...I forgot. Well, they would look great, as the centerpiece at a tea party, wouldn't they? Look closely. Can you see the pale lime green color deep inside their blooms? That little detail really makes these orchids gorgeous! Would you take a good look at the ruffles? 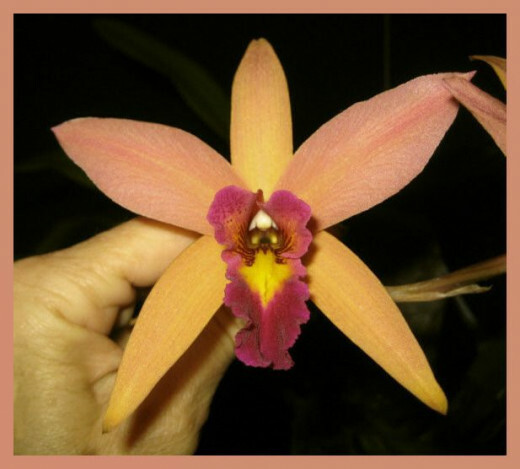 Look at how L-O-N-G the lip is, and how the red, yellow, and pink all "travel" down the orchid's throat! I don't know why, but this one reminds me of Mardi Gras. Now, I have never been to Mardi Gras, and probably wouldn't go to it, if I could. Too hard to find accommodations, and I am just not a "party animal". But, this orchid has always made me think of that particular event. The orchid really is - that intense! This is one GIGANTIC orchid; the largest bloom in our orchid jungle! This is one I call..."Glory Be"! When this orchid blooms, it is almost unbelievably gargantuan! From petal to outstretched petal, this orchid is about seven and a half inches across - THAT, is a big orchid! If I had thought about it, I would have taken a photo of this giant orchid next to one of my husband's miniature orchids. Then, you would have been able to see how huge the bloom actually was - it had the largest bloom of any of the orchids that he grows. I am constantly overwhelmed by the beauty that God's hands have placed here, for us to enjoy, and speaking of enjoyment - I sincerely hope that you have enjoyed my husband's passion - growing orchids, for the love of orchids! Of all things! Here, we have a book that actually can be known by its cover. This incredible book on ORCHIDS is sure to turn you into an "orchid addict". Once you really get a good look at the beauty and splendor of orchids - they are hard to resist! This book is most definitely worth reading, and would delight any orchid lover! By the way, I think my husband grows some of the world's most beautiful orchids! This frail-looking little orchid is quite a gal. She is demure, sweet, and every inch a lady. I doubt she would win "Best in Show", but she is a beauty! Normally, I am not drawn to pastel colors. I much prefer intense, rich hues and striking contrasts. This lovely lady was an exception. She is so delicate, and perfectly formed - who could not love her feminine beauty? I was only blessed to see her bloom one time, as she was one of our beauties that perished in the bitter cold winters that descended upon us a few years ago. It was providential that I photographed her when she bloomed, or none of us would be enjoying her beauty right now! 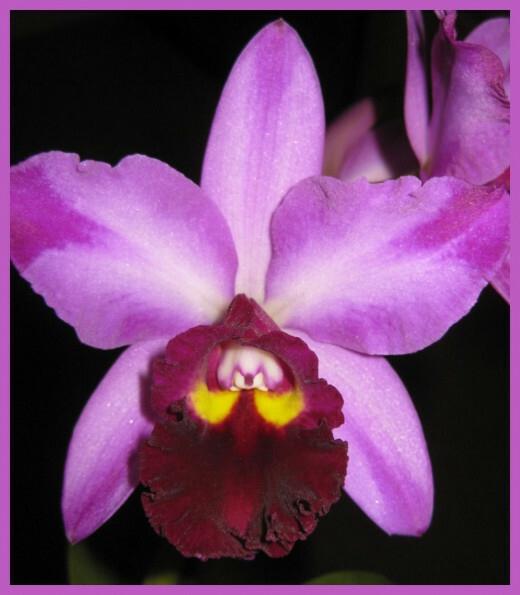 The beautiful orchids featured in this article, are merely some my husband grows, that I highlighted for you. He also grows some Alien Orchids, or at least that's what I call them, some Angel Orchids - they do look like angels, and some of the strangest looking orchids you ever saw! The orchid photos were all taken by me, of orchids that were designed by the creative hand of God, and grown - in the rough - by my husband! 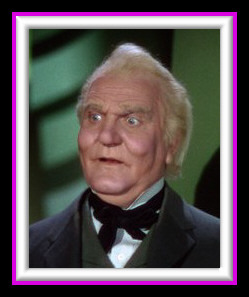 Photo credits: All images portrayed in this article with the exception of "The Wizard" were photographed by the author, E. Tack. Did you vote in our Poll? 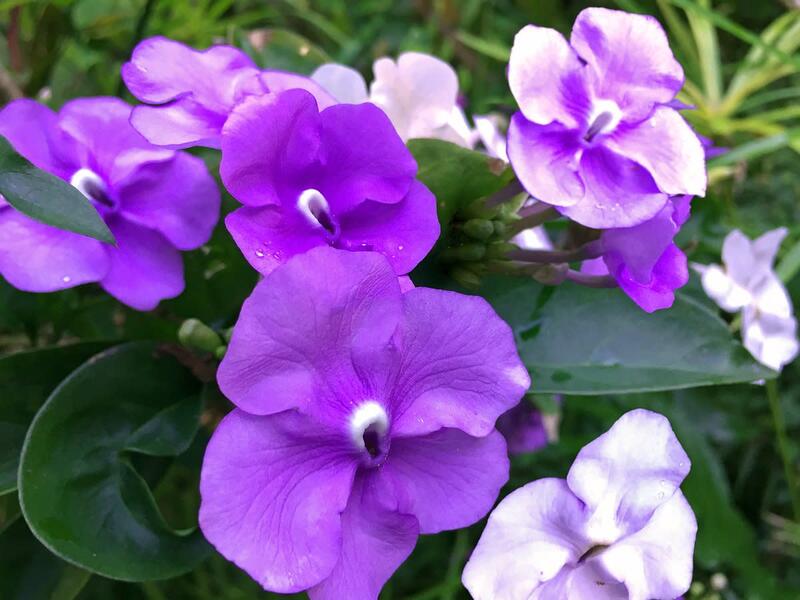 If you like the orchids, please take a moment, and go back almost to the top, and cast your vote for your favorite orchid, in our poll. I'll pass on your comments, but you'll have to leave them here. 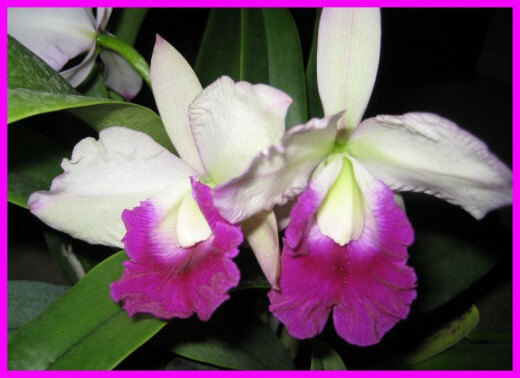 He loves people enjoying his orchids, though, so feel free to tell us if you like them. Who knows? Maybe he'll start giving tours....on second thought, that's...not likely. Thanks for the secret tour. beautiful! Lovely orchids! They looked so enchanting and full of bloom! He really is a "Wizard" with his Orchids and his love for them shines in their beautiful blooms. You are the fortunate one who gets to 'tour' the wizard's orchids. 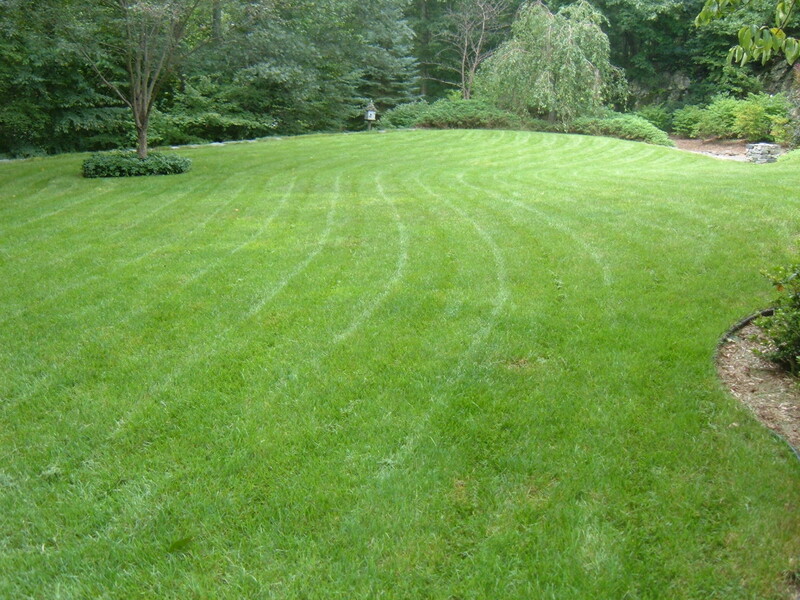 Your photographs (and delightful descriptions) are terrific! Love the way your lens flow. I love orchids and I have several around me. For some time, I could not make them flower again. Then, I found out from a neighbor that she soaks hers in a pail to give the roots water and then hang them. She gives them a bath in rotation. This worked. Now I always have flowers without buying new ones each time. @anonymous: Thanks, Sashi! So glad you like them, but, I don't think he's lucky - I feel blessed to be his wife. Delighted you came! @callinsky lm: Thank you - tonight, I show him. He'll be amazed so many people like them. I love his orchids. That being said, I believe your writing about his orchids really adds to them. Very humorous.